The Style ORGAN SYNTH Model. 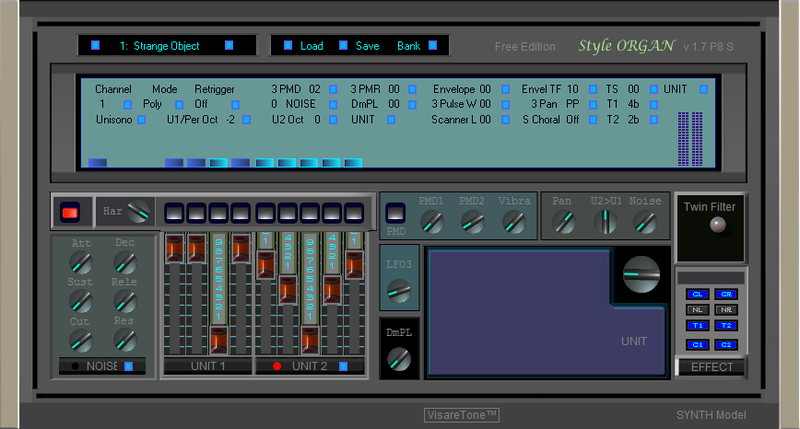 The Style ORGAN SYNTH Model is a Synthesizer, Instrument and Classic Organ in one. The SYNTH Model is a development of line Style ORGAN. Combo of simulation of legendary Tonewheels Organ and old idea of Analog Synthesizer. Vibrate and rotary Organ, Church Organ , Piano, Cello and Violin, Flute, Bell, Choir, Orchestra. Expressive - dynamic Synthesizers. Bank -128 Presets. Many another at main Panel and container UNIT /LFO, Pitch, Level, Twin Filter-combine LowPass, Band Pass, Hi Pass and Band Reject/. Copyright © 2019 VisareTone. All rights reserved.